When water enters your home, usually through your basement, it can only lead to unpleasant conditions, such as musty odors, mold, and much more. Sometimes, it's possible to stop this water from ever entering your home. There are several kinds of exterior drainage systems that might be appropriate for your home - and Ohio Basement Authority can help you find the best solution! Ohio Basement Authority is an experienced basement waterproofing and repair company with the tools and technicians required to fulfill your exterior drainage needs. We'll inspect your property and promptly get to work on the system best suited to help your property. 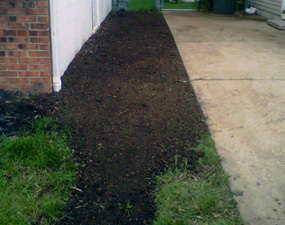 To get started on your outside drains, schedule a free estimate with Ohio Basement Authority! 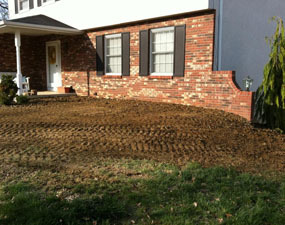 We serve customers in Columbus, Springfield, Mansfield and areas nearby. What type of drainage service do you need? Quickly and efficiently controlling water and directing it away from your foundation is a critical aspect of preventing a wet basement or crawlspace. Downspouts channel water from the gutters to a storm sewer, city outlet, ditch, slope, swale, or catch basin. 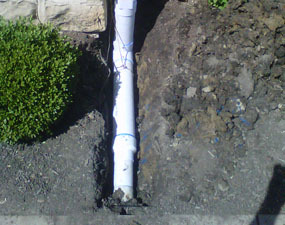 In most cases, a triple wall polyethylene pipe of 3"-4" diameter will be used for downspouts. This type of pipe will not split, break, or crack and is more impact resistant than PVC, ABS, or styrene. A positive grade is created on the exterior of the foundation wall to allow water to drain to the appropriate location away from the foundation. Grading can have a strong impact on the amount of water running down your home's foundation wall on the exterior of the structure. In certain situations, the use of a gravity drain may be possible. When the grade of the property is steep enough to allow the use of a gravity drain, the installation of pipes and non-compactable gravel may be used in lieu of a sump pump for your home's specific drainage needs. 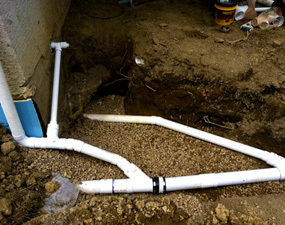 French drains include the installation of a perforated pipe underground, seated in non-compactable gravel, to allow water to slowly leach in and drain to the appropriate area away from your home's foundation. Installing exterior drains is just one of the many ways that Ohio Basement Authority can help you keep your home safe and dry. If you believe your home might be a good candidate for one of the several kinds of exterior drainage systems we provide, if you're looking for more information, or if you're in need of other additional services, Ohio Basement Authority is here to help. Schedule a free estimate in Springfield, Columbus, Mansfield or nearby today!